Bellafill is the only injectable collagen treatment with PMMA (polymethylmethacrylate) microspheres approved for the correction of moderate to severe, atrophic, distensible facial acne scars on the cheek in patients over the age 21 years. 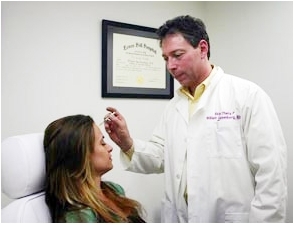 Bellafill is the only distinctive FDA approved dermal filler on the market for the correction of moderate to severe atrophic, distensible facial acne scars on the cheek in patients over the age of 21 years. It was approved for the correction of facial wrinkles (nasolabial folds) in 2006. Bellafill adds volume below the scar to lift it to the level of surrounding skin for the smoother skin you’ve dreamed of. 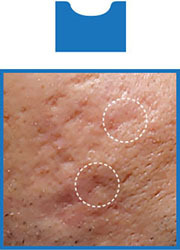 Immediate correction and lasting improvement for pitted acne scars. A simple, in-office treatment with no downtime. You can immediately resume your daily activities. 90% of patients were satisfied at 12 months. Can Bellafill treat your acne scars? There are three types of pitted acne scars icepick, rolling and boxcar. Bellafill is indicated to treat rolling scars. Soft shoulders and rounded saucer-like shape. Bellafill is only for correction of distensible, rolling acne scars. Sharp vertical edges with a wide base. Atrophic (pitted) scarring starts with aggressive acne inflammation. The inflammation can lead to irregular healing and loss of collagen, which is a key structural component of skin. This can result in a pitted or sunken and uneven skin surface. The collagen provides immediate volume below pitted acne scars to lift them to the level of surrounding skin. Bellafill is injected underneath the wrinkle, just above the skins fat layer. Bellafill provides the soft, supportive foundation that your skin needs for long-lasting wrinkle correction.